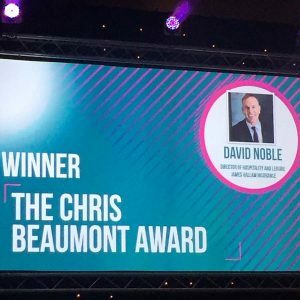 Our Director of Hospitality and Leisure, David Noble was presented with the prestigious Chris Beaumont Special Award at the Springboard Awards for Excellence. Each year the Award is given to the individual, organisation or partnership demonstrating the most outstanding overall contribution towards achieving Springboards aims over the last 12 months. The audience included many leading figures from the hospitality industry and was hosted by Olympic swimmer Mark Foster.